IITA Director General Nteranya Sanginga led a CGIAR delegation comprising other DGs from AfricaRice, the International Livestock Research Institute, and the International Food Policy Research Institute, to a planning meeting on 21-22 January in Abidjan. The meeting was convened by the African Development Bank (AfDB) to discuss resolutions from AfDB’s High Level Conference on African Agricultural Transformation, which underscored the need for Africa to “execute a bold plan to achieve rapid agricultural transformation by raising agricultural productivity.” Other attendees included representatives from the Forum for Agricultural Research in Africa (FARA), Dalberg Global Development Advisor, and Africa Harvest. 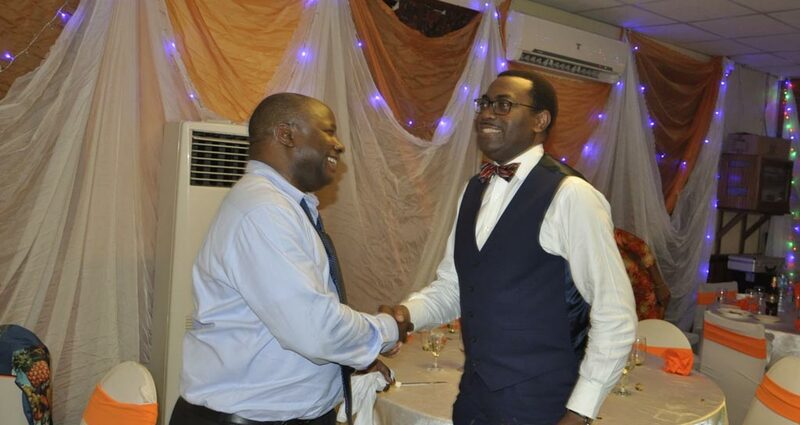 DG Sanginga and AfDB President Adesina. During his inaugural remarks as President of AfDB, Akinwumi Adesina highlighted the Bank’s focus on five priority areas to achieve the much anticipated advancement in Africa’s transformation agenda: light up and power Africa, feed Africa, integrate Africa, industrialize Africa, and improve the quality of life for the people of Africa. Speaking on the principles for raising Africa’s agricultural productivity by 2025, DG Sanginga enjoined participants to work towards identifying and eradicating all obstacles preventing agriculture on the continent from becoming a thriving business venture, and said that milestones achieved in the initiative must be presented in clear and measurable terms. “The end result of interventions in the Feeding Africa initiative should be thriving small, medium, and large-scale agribusinesses in every segment of key value chains on the continent…We must resolve how to tackle production constraints such as land tenure and lack of expertise, for instance…After the development of a technology and outreach plan, we need to determine what CGIAR can do to enable interventions; for example: improved technologies such as new varieties, seed systems, natural resource management practices, processing, incubation of agribusinesses along the value chain, to attract private sector investment/interest,” he said. CGIAR centers were particularly enlisted to drive the Feeding Africa initiative because of their long years of groundbreaking and innovative agricultural research. It is anticipated that this joint effort will speed up the continent’s move towards achieving food security and also equip future generations with new knowledge to sustain Africa’s agricultural advancement. Looking forward, the Bank plans to partner with CGIAR and FARA, with IITA taking the lead, to revitalize and transform agriculture with the goal of Feeding Africa within the shortest possible time. As a first step, IITA will be organizing a Program Identification and Preparation Workshop in its Ibadan campus, on 22-26 February. Directors General of the various CGIAR centers and African NARS who have expressed interest in the program have been invited to join an AfDB Program Mission team to the workshop, during which crucial steps to move the Initiative towards full proposal development will be discussed. The implementation of the Feeding Africa Program is expected to effectively start by 1 January 2017.